Spoof news: McCain ends campaign, backs Obama! McCain ends campaign, backs Obama! 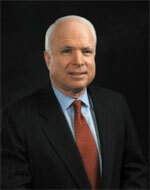 Colorado - John McCain today announced his decision to end his campaign and throw his support behind Barack Obama (D-IL). "After a tireless campaign, I can no longer deny the media and the pollsters. I have no chance to win this thing, therefore effective immediately, I'm ending my campaign for the White House." stated Sen. McCain from his campaign bus in Colorado. Sarah Palin (R-AK), Sen. McCain's former running mate was shocked at the news. "Is this some kinda, ya know, joke or something?" asked Palin. When her advisor confirmed the reporters statement, Palin stated, "I'll hafta get back to ya on this one..."
John McCain is rumored to have been offered the head of the Veteran's Affairs Dept. in an Obama administration to which, the McCain camp had no comment. Before boarding the "Straight Talk Express" one last time, McCain said, "I wish Sen. Barack Obama the best. I hope he doesn't tax us all into oblivion!" The GOP has released a statement saying, "Sen. McCain is a traitor."